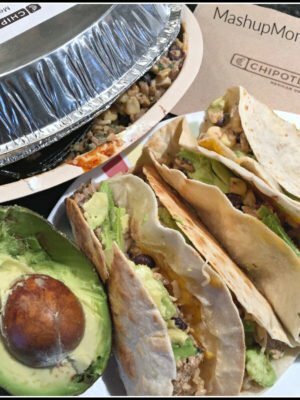 Sometimes you just need some good old-fashioned comfort food in your life, right? 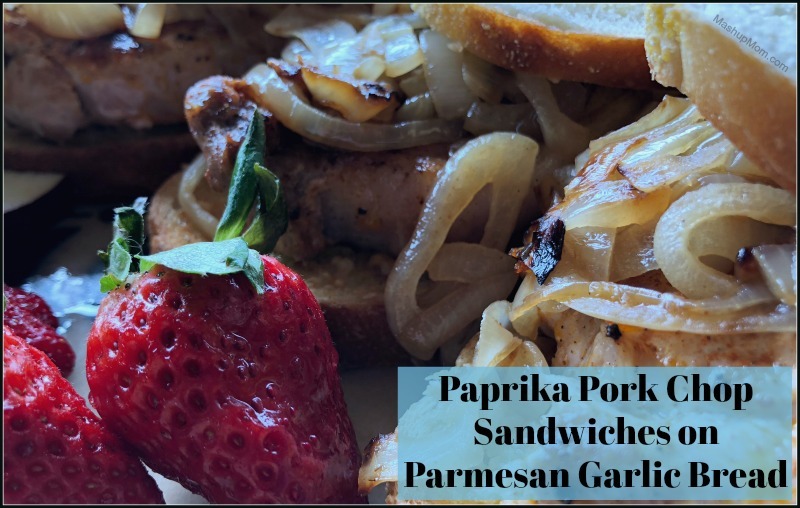 Enter: These Paprika Pork Chop Sandwiches on Parmesan Garlic Bread! This week I bought some nice thick cut pork chops on sale at my local produce store, and decided that they fit perfectly into this latest edition of Sunday Scratchups, your weekly recipe from scratch around grocery sales and affordable ingredients. Pork chops often go on sale, and making them into hearty sandwiches is a way to stretch two good sized chops to feed a family of four (and, feed them well…). 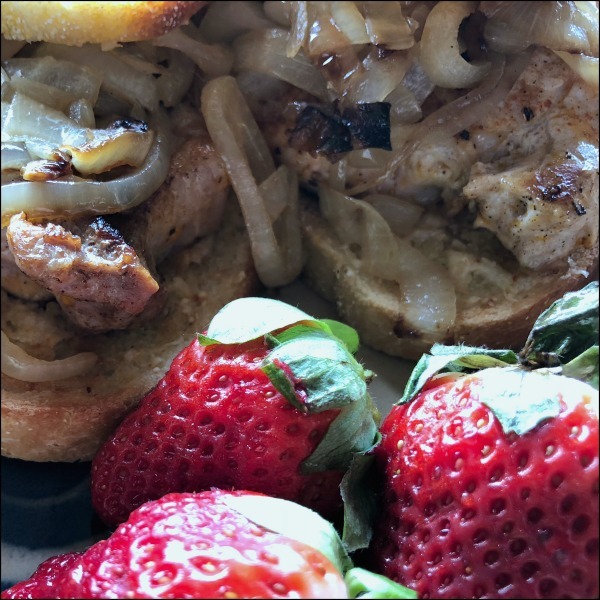 We just ate our pork chop sandwiches with some strawberries and apples, but their garlicky, salty flavor and hearty, chewy texture would also pair nicely with a green salad or with other crispy veggies. Start by cooking up your onion. Heat olive oil in a 12″ cast iron skillet over medium heat until shimmering, then add onion, season with sea salt, and saute for about 12 minutes until softened and nicely browned, stirring occasionally. Remove to a small bowl and set aside. While the onion is cooking, arrange bread in a single layer on a rimmed baking sheet. Combine butter and minced garlic, then butter each piece of sourdough with the garlic butter mixture and sprinkle them evenly with Parmesan. Broil for 5-7 minutes on high, or until butter is nicely melted and cheese is browned (taking care not to over-brown). Once the onion is done, cook up your pork chops. If you just have a couple large chops like I did here, cut your pork chops so that you have four even pieces, and season them on both sides with paprika, sea salt, and black pepper. 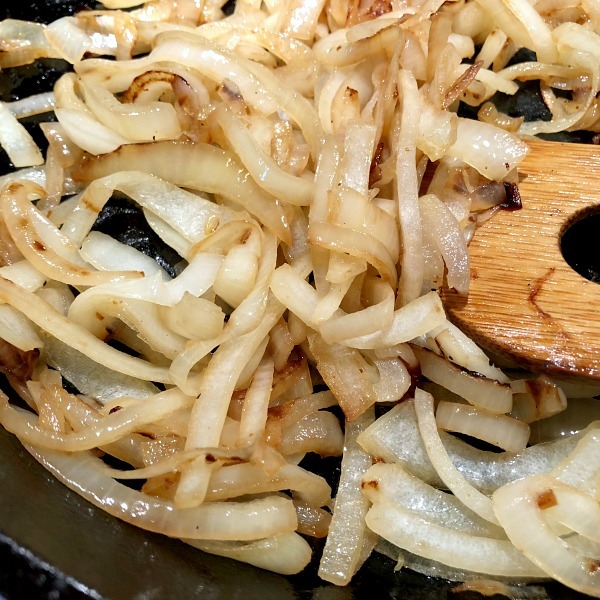 Add another Tbsp olive oil to the same skillet you used for the onion and heat it over medium high heat until shimmering. Add pork chops, and cook for 4-5 minutes a side until browned and at an internal temperature of 145 degrees. 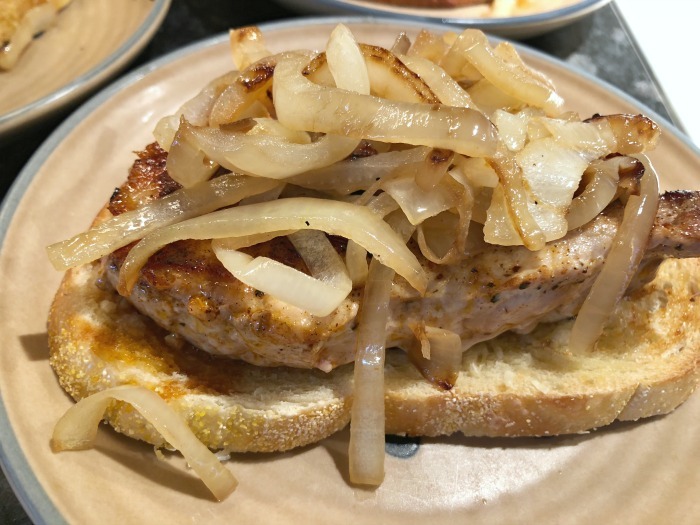 Assemble your sandwiches by placing each pork chop inside two pieces of garlic bread, and topping the pork with sauteed onions. Note: The cooking time on the pork will vary, depending on the thickness of your pork chops. 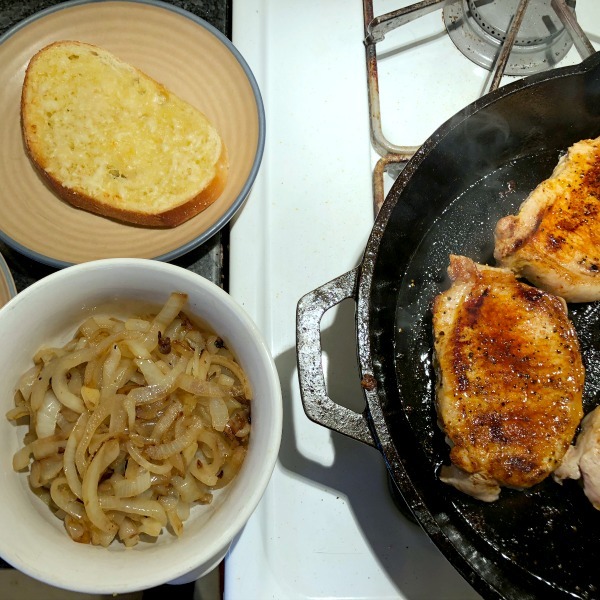 Note also that broiling the garlic bread browns the garlic butter side yet keeps it softer on the other side, which is what we want for our delicious (yet somewhat messy) pork chop sandwiches here! Just add a little fruit alongside these filling pork chop sandwiches, and you have yourself a satisfying dinner. The salty Parmesan and the tangy onions work together to bring out the natural flavor of the pork, which doesn’t need a lot of spicing up: Just a little salt, pepper, and paprika keep it simple and flavorful. 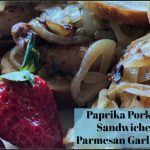 These are pretty quick to throw together, too: If you make your garlic bread in the oven while cooking up the pork chops and onions on the stove top, this entire comforting pork chop sandwiches dinner takes just about 30 minutes start to finish — making it a great weeknight dinner choice! All the boys here were big fans. Pork chops often go on sale, and making them into hearty sandwiches is a way to stretch two good sized chops to feed a family of four (and, feed them well...). Start by cooking up your onion. Heat olive oil in a 12" cast iron skillet over medium heat until shimmering, then add onion, season with sea salt, and saute for about 12 minutes until softened and nicely browned, stirring occasionally. 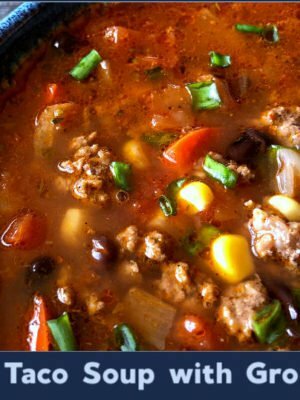 Remove to a small bowl and set aside. While the onion is cooking, arrange bread in a single layer on a rimmed baking sheet. 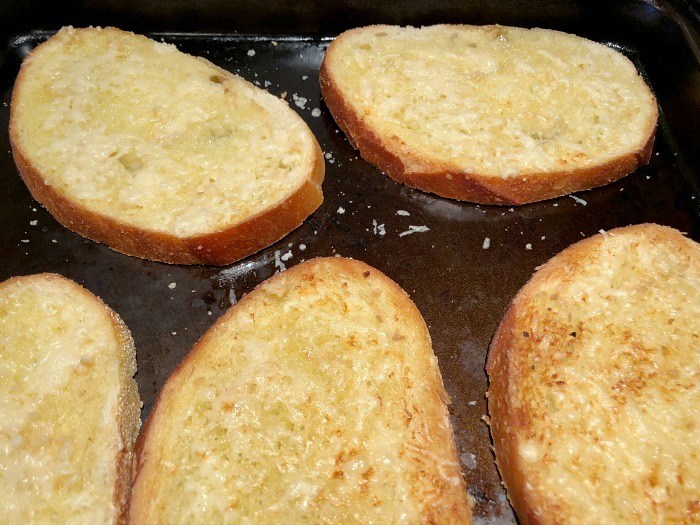 Combine butter and minced garlic, then butter each piece of sourdough with the garlic butter mixture and sprinkle them evenly with Parmesan. Broil for 5-7 minutes on high, or until butter is nicely melted and cheese is browned (taking care not to over-brown). The cooking time on the pork will vary, depending on the thickness of your pork chops. 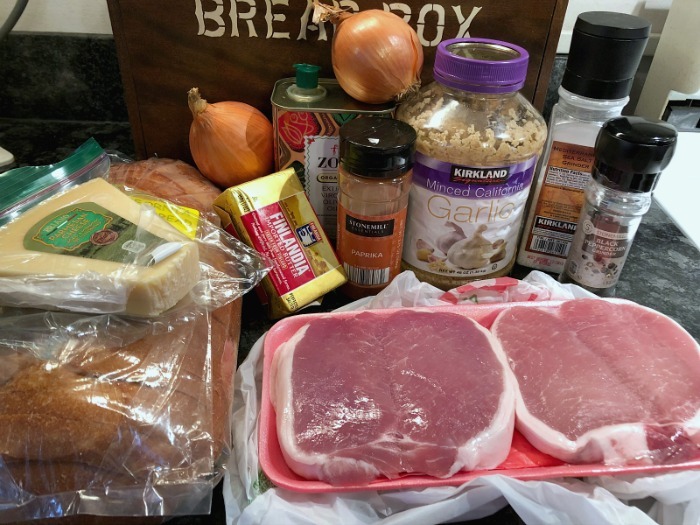 Note also that broiling the garlic bread browns the garlic butter side yet keeps it softer on the other side, which is what we want for our delicious (yet somewhat messy) pork chop sandwiches here! How something so simple is oh so good, surprises me every time. My hubby says this has to be in the regular line up. Can’t say enough. 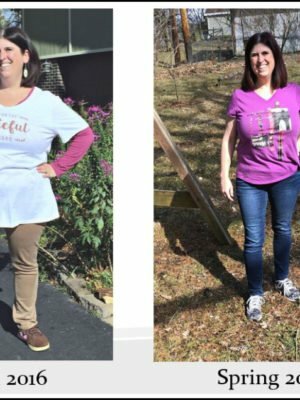 Question on the chops… Did you trim the fat at all and if so did you do it before or after cooking? This meal!! We just had it and it was amazing!!! 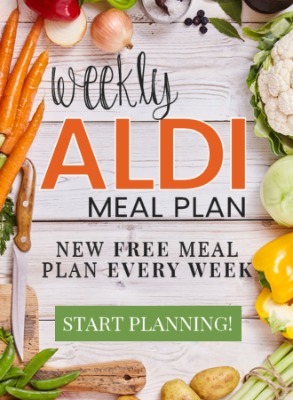 Our family of 6 just signed on to the Aldi Meal Plan, and our first dinner was the Paprika Pork Chop Sandwich meal. 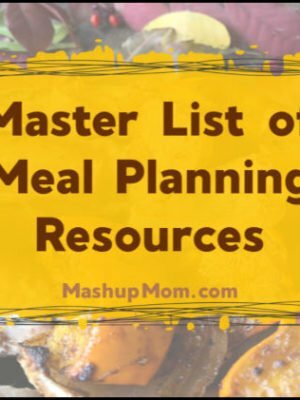 We doubled the meal plan, so the leftovers would provide our next day lunches. The meal was a big hit with all of the kids, there were some leftovers for lunch, and nobody walked away from the table still feeling hungry.